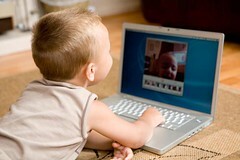 Many parents have become hard-wired into thinking that computers are bad for children. But are they? New research suggests that it’s actually a mixed bag. Yesterday, I was over on PoliticsDaily.com looking at this age-old, vexing parenting question in light of new research that tries to systematically estimate the effect of home computers on child and adolescent outcomes. Image: Macbook by Swansea Photographer via Flickr under a Creative Commons License. Clearly, computer skills are essential to everyone, and some programs, games, etc., should be fine for kids, so long as c-time is responsibly limited & monitored. This gets trickier, of course, as children grow, but what doesn’t? Balanced use of time & activities is what most parents would (we trust! )wish, but that, like everything else about parenting, is sometimes easier said than done.